The Paleo Diet is one of the most effective diets in the health world today. It identifies the similarities in the human genome between people who lived in the Paleolithic era and those who live today. In ancient times, the human diet consisted mostly of meat and wild vegetables with occasional fruit and seeds. Legumes, grains, dairy, sugar and trans-fats were not a part of the Paleolithic diet, and as such are not consumed on the Paleo Diet. Going on Paleo is effective but restrictive, and it can be difficult to know exactly how to snack while still following Paleo guidelines. Some of the most obvious snacks to stick to when you are following the Paleo Diet are vegetables. Carrot and celery sticks, raw broccoli, cauliflower and green peppers are all excellent snacks to curb your appetite while following Paleo. They are full of vitamins and nutrients, have a satisfying crunch that helps to curb cravings for unhealthy snacks like chips and crackers and are easy to prepare and carry on your person for snacking at a moment’s notice. Meat based snacks are another great option for Paleo. Beef jerky is beloved by many Paleo followers, specifically jerky that uses low to no sodium or sugar and instead seeks flavors through other spices. Even without salt, spicy jerky like this can be very flavorful. A few ounces of grilled chicken is also an acceptable snack for Paleo. Considering a piece of meat as a snack can take some getting used to, but it has valuable protein which fuels the human body and gives it energy. Although they should be consumed sparingly, nuts are also a snack that is acceptable on the Paleo Diet. This should be researched carefully, as some nuts are in fact legumes. Legumes are not an acceptable part of the diet. Nuts that are actually seeds are the best kinds to eat. Most notably, peanuts are a legume and should be avoided. Nuts that are consumed on the Paleo Diet should be eaten raw, which generally rules out the consumption of cashews as well. Snacking on Paleo doesn’t have to be hard with these helpful hints. Veggies, meat and nuts are all packed with nutrients to get anyone through the day and satisfy a hungry stomach. The weight loss and health benefits of switching to Paleo snacks over unhealthy chips and junk food are remarkable. 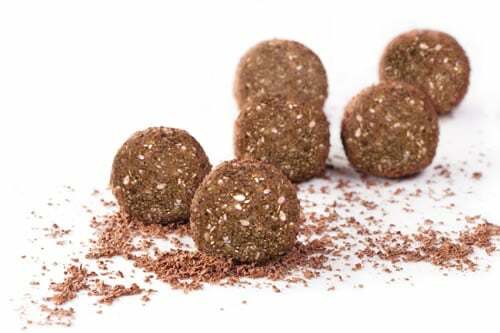 180 Nutrition offer a superfood that can be used to create a whole host of paleo snacks. With natural ingredients and vegan options our paleo protein powder is free of all chemicals and processed ingredients.